For the 2015-2016 academic year, more than 175 students received Bloch School-specific scholarships. Included were 21 members of the inaugural class of the Intensive Full-Time MBA, who each received full-tuition awards. “To our supporters, I hope you know how vital and appreciated your backing is,” said Dave Donnelly, Ph.D., dean of the Bloch School. “While your donations certainly decrease the tuition burden for the students you have met today, the impression on the scholarship recipients goes deeper than that – it shows them the impact a single individual or organization can make and how every little bit makes a big difference,’” said Donnelly. 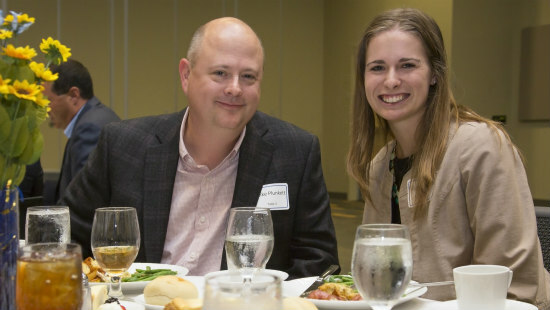 More than 20 donors and 100 students attended the Best of Bloch luncheon to celebrate the generosity of the donors and the resulting success of the students they support. “As you can imagine, there is a huge need for scholarships and other types of financial assistance among the UMKC student population,” said Kami Thomas, assistant dean for student services at the Bloch School. According to Thomas, the Bloch School’s primary goal is to increase the number of awards available and the amount awarded, eliminating as much of the financial burden as possible for students upon graduation. Senior Yasmin Musaddiq shared with donors the impact their gifts have had on her. Donor Mike Plunkett (B.S.A. ’91) established a scholarship to honor his wife and tell her story, and he encouraged others to consider taking the same step. Plunkett, like Musaddiq, wanted to go to college far away from home so he went to school in Texas. After reading about Henry Bloch’s commitment to the Bloch School, he returned home and started there in his junior year. Plunkett and Dave Cornell, Ph.D., associate dean of Bloch, started the Laura Walsh Plunkett Scholarship to honor her and to share the things she did. “I encourage you to get involved. It’s not just the money and not just for recognition. It’s your obligation to get involved,” said Plunkett. Given the applause she received, Musaddiq effectively expressed the sentiments of the students attending the luncheon. “I want to attend the London School of Economics for my master’s degree. Getting through school means I can be successful and help someone pay for their education in the future,” said Musaddiq. “I have depended on your kindness, your trust, your support and your donations toward my education. Thank you for being kind strangers,” said Musaddiq. This entry was posted in Alumni and Friends, Events, Students by Megan Cooper. Bookmark the permalink.